Should the subject of performance recommend itself still through the genius, wit and taste Austen refers to above, readers could do far worse than to look to the much maligned graphic novel for inspiration. It is exciting therefore that Holtzbrinck Publishing in New York and Pan Macmillan should have collaborated in the formation of a new imprint, First Second, for the wide dissemination of the form across both sides of the Atlantic Ocean. Comprising of nine interwoven episodic chapters, we meet a bizarre cast of characters and players. Starting off with what appears to be a charming idyll, events rapidly take a turn towards the depraved and the gratuitous as misfortune follows misfortune, bodily functions are taken to extremes and sado-masochistic tendencies are lived out. This is an unexpected yet somehow also a deeply satisfying read. In the body of this text there are no words. Between individual frames and their guttering, we as readers are liberated to interpret and decide upon time-spans, probable actions and interactions and ultimately to sequence this narrative form. There is nothing derivative in an art-form that prompts us towards this and in an age when visual literacy exercises an increased dominance ‘ whether through computers and the internet, the television, cinema etc ‘ it can surely only be a matter of time before proponents of the graphic novel exert influence to ensure works such as ‘A.L.I.E.E.E.N.’ assume their rightful place within mainstream literary discourse. Paul Stewart and Chris Riddell share one of the most dynamic author-illustrator partnerships in children’s literature today. The fruits of this truly collaborative process shimmer, shine and truly stand-out from the crowded book shelves in shops, libraries, schools and homes. Their ‘Far Flung Adventures’ series ‘ each one eponymously named after its hero or heroine ‘ have charted a fantastical world perfect for fuelling the minds and imaginations of small children. ‘Hugo Pepper’ is the third, and sadly reportedly also the final, novel in this series. Mystery, adventure and humour combine as Hugo pieces together the fragments of stories amassed by renowned story collector Wilfrid McPherson, the background to the blight that The Firefly Quarterly has become upon Firefly Square and the role of himself and his family to the legend of Brimstone Kate and her lost treasure. The joy here is that readers make their own deductions in parallel alongside Hugo to arrive at the various kinds of misappropriation the media are wielding to exert control over the community of Firefly Square. A disconcerting sense of insularity and introspection accompanies the statistic that only three percent of books published in the UK are translations. It is heartening therefore that publishers such as WingedChariot Press www.wingedchariot.com and Floris Books www.florisbooks.co.uk are making available in the English language a range of European picture books. 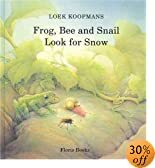 Dutch author and illustrator Loek Koopmans’ book ‘Frog, Bee and Snail Look for Snow’ is the latest addition to the list of translations from Floris Books. Just as Kenneth Grahame’s opening to the ‘The Wind in the Willows’ with mole scraping, scratching, scrabbling and scrooging, ‘muttering to himself, ‘Up we go! Up we go!’ till at last, pop! his snout came out into the sunlight” marvellously evokes the long awaited onset of spring, Koopman’s use of intensely bright light in the forest, the vivid fresh greens of the foliage and the irreverent chattering of little bird brilliantly capture that first sense that spring has sprung. Koopmans illustrations of nature are wonderfully rendered and are brilliantly accurate. His use of lighting brings each spread to life helping to create a beautiful book with an unexpected, yet a holistic ending. Gambling! How many times might the Geography teacher blow his nose, how many times might the French teacher interject ‘Well’ into his discourse and how many times might maths teacher, Wobblebottom, scratch?! The possibilities are endless and soon Harvey and George’s ‘Chancer Syndicate’ becomes the speak of the school. Through a series of deft moves some form of resolve is reached for each of the above and the constituent parts of this novel make for a real romp of a read that will leave readers ravenous for more by Pete Johnson. On concluding the novel one can’t help but wonder whether Harvey and George have learnt more practical skills and greater awareness than their prescribed school-life could ever have taught them’ a chilling conclusion to be left pondering. The debate over nurture and nature, inherited and acquired tendencies and characteristics continues to be assuaged through education and child development theories. ‘What do elephants do’ forms a phenomenological exposition through the eyes of an anthropomorphised baby elephant, Esme. From here-on-in, the story focuses around Esme’s needs and wants as she encounters the world around her and its manifold inhabitants’ When Esme is thirsty, she sees zebras drinking and wonders ‘What do elephants do?’ When Esme is hot, she sees tortoise shaded by his shell, but, ‘What do elephants do?’ This simple, yet clever framework forms the base for the remainder of the story as Esme learns just what it is that elephants do and the importance of her trunk, thereby realising her own identity. An elephant’s proboscis is a strange, peculiar and fairly alien appendage, through sensitively examining its role and importance to the identity of elephants, Hazel Lincoln creates a valuable message as to the importance of assessing actions rather than mere appearance. Here is a beautifully consistent picture-book whose world is safely outlined within its first double-page spread and given character and brought into context thereafter. Published originally in German and translated into English by Polly Lawson, ‘In the Land of Merfolk’ represents another European offering to the UK picture-book market made available through Floris Books. Cheerfully combining poetry with expansive pastoral landscapes viewed at the eye-line of little people themselves, this book takes us on an imaginative and magical tour of the countryside depicted through the seasons. There is nothing incongruous in the fact that fairies, elves, mermaids and nymphs form a part of the populace on the pages and the loose descriptions of their actions and lifestyle leaves readers to piece together their own ‘take’ on this world-view provided in miniature. Daniela Drescher’s short book leaves one pensive in contemplation as to belief and the experiential evidence of the senses. Agatha Bilke is a problem child, a girl with more than a passing penchant for arson. At their wits end, her parents admit her to the TreadQuietly Clinic for interesting children an institute run by Dr Alan and Tim Humphrey, who believe they have developed the ultimate ‘creative’ therapy that will revolutionise the treatment of all forms of childhood anxiety, phobia, hysteria and neurosis’ their belief is somewhat misplaced. This is journalist, Sian Pattenden’s first children’s books and Short Books fist work of fiction and it is certainly a most distinctive and readable offering. 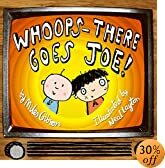 Characters in this short, pacy book are in equal parts peculiar and endearing ‘ Barry, a boy who has the unfortunate affliction not to be able to refer to himself in anything but the third person, is one of the most humorous and memorable. Each child admitted to the TreadQuietly clinic has his own particular fear, phobia or some-such foible; for one this is toast, for another the belief that meteorites might befall the planet at any given point’ Treatment of these characters is largely individualistic which provides a framed setting for a series of vignettes rather than the cohesion of more traditional novels. The stylish and sophisticated illustrations lend the book a quirky fable-like feel. It would sit comfortably amidst stories with a similar ‘cautionary’ feel including Tim Burton’s ‘Melancholy Death of Oyster Boy’, Tom Baker’s ‘The Boy Who Kicked Pigs’ and of course the seminar tales by Hillaire Belloc. So speaks the strange green child that twelve-year-old Elizabeth finds in the forest as she secretly tends a ruined Catholic shrine. The year is 1586 and Protestant England is an unforgiving place for Catholics. But mindless blame, fear and persecution are nothing new, as the green child, Isabella, can testify. She herself was born more than three hundred years ago, the child of a wise woman and midwife. Her mother was executed as a witch, a scapegoat when a rich family’s baby was born with a faulty heart, and since then Isabella has hidden mostly in the land of faeries, leaving her bones hidden in a hollow tree awaiting her return. Yes, this all sounds a little strange, but Sarah Singleton has a gift for blending the seen and the unseen, the matter-of-fact and the magical, into a convincing whole. After all, what is the magical other than something we are not used to or don’t understand? And that is what this book deals with; the problem of how the different (in this case the spiritually different) can be demonised by the unthinking mob. Set against the hounding of Ruth Leland (Isabella’s mother) and the sixteenth century persecution of Catholics is the simple and powerful friendship that develops between the two girls. For Isabella her tragedy is done, and yet she berates herself for not having stayed at her mother’s side until the bitter end. For Elizabeth the fear has just begun: the Queen has sent the brutal Christopher Merrivale to hunt for the priest that her family is sheltering. Perhaps here there is a chance for the two girls to help each other: for Isabella to gain ‘closure’ and a second chance with a loving family, whilst Elizabeth gains safety and escape. A highly appealing, multi-dimensional historical adventure. Check it out. As well as exploring issues of friendship and of the unwitting bullying, or manipulation that arises through the story, illustration and text operate on dual and dialectic levels exploding into other arenas to create a neat summation of Colonial intent, comment on environmental conservation through the island’s shifts from Utopian paradise, to Dystopic nightmare, and arguably of patriarchal dominance also ‘ symbolised here through Napoleon’s telescope, a phallic construction utilised primarily as his access-point to the island and secondarily as his power-stronghold over Crab, Bunny and Bear. If that sounds unlikely fare for the double-folds of a picture book, look at the story, think about its themes, subtleties and nuances and decide for yourself. Through empowering the use of picture-books regardless of age, ability or background, we are opening the door to infinite interpretations of visual and textual narrative strands, we are allowing readers to invest their own experiences, rationale and world-views, we are creating a base for infinite interpretation and discussion and are thereby realising just what makes reading such a singular recreational activity! 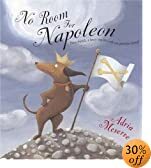 Needless to say Adria Meserve has crafted a story that motivates, inspires and truly does show the ‘dog’ in the dogmatist!